I once saw a bumper sticker that said, “Without our families, we wouldn’t need alcohol!” My first reaction was to laugh. Then I realized that there is some truth in that statement. 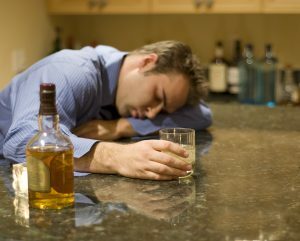 If you are in recovery from alcoholism and/or other addictions, you’ve probably figured out that the substance itself is not the only problem. You can stop drinking or using, get through the withdrawal, cope with the cravings, but that doesn’t mean you’re home free. Drinking and using drugs often start as a way to cope with stress. It can seem like they’re helping you to take control of your life. For instance, you may find that drinking alcohol helps you to relax and be more comfortable in social situations. Or that using cocaine gives you energy and helps you to think. Or that using heroin helps you t o forget about something painful in your life. At some point, though, you start to wonder who’s really in control. Is it you, or is it the alcohol and/or drugs? That’s when you begin to realize that instead of solving those original problems, you’ve just added another problem. It’s hard to quit drinking and using on your own. And it’s even harder to stay quit, especially when your other problems start rearing their ugly heads again. I believe that, for many people, 12-step groups such as Alcoholics Anonymous and Narcotics Anonymous can be very helpful. I also think that counseling can help. And I offer an acupuncture treatmentthat not only relieves cravings and withdrawal symptoms, but also helps to relieve depression, anxiety, and other issues. If you’re struggling with alcoholism and/or addictions, I’d love to help. Call me at 240-401-8086 or make an appointment online. Are you struggling with cravings and/or withdrawal symptoms related to alcohol or other addictive substances? There is a simple acupuncture treatment that can help. 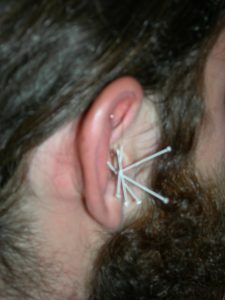 This auricular acupuncture treatment, often called acudetox, has been shown to be helpful in relieving acute symptoms of withdrawal from alcohol, heroin, crack, cocaine, and other drugs, including the nicotine found in cigarettes. Clients often feel immediate relief and lessening of tension and anxiety. Further treatment may reduce profuse sweating, headache, body ache, stomach pain, runny nose, drug dreams and cravings. Acudetox may also help to relieve depression, insomnia, fatigue, restlessness, and symptoms of trauma, as well as helping the client to feel a greater sense of connection with him- or herself. Acupuncture is performed by placing thin, sterilized needles into the ear and body. Acudetox involves placing needles in each of your ears; these needles will be left in for between 20 and 45 minutes. I can administer acudetox as part of a therapy session.